There’s nothing quite like eating chai and pakoras, especially on a rainy day! There’s also other amazing deep-fried food that many of us love, such as samosas, vadas, and bhaturas. Although to make any of these dishes, we need a deep-fry pan or what we often call a “kadai”. It can be difficult to select one though, especially when brands like Hawkins Futura, Pigeon, and Prestige all have similar looking products that claim to be different. This article will explain how to choose the best kadai from among all various types of deep-fry pans that are available. In the latter half of this article, there will be a list of top 10 best deep-fry pans you can buy online in India, so hopefully, you’ll be able to find a kadai to suit your needs! Deep-fry pans can vary based on their size, shape, and the material used to make them. There are also other specifications you may want to check, such as the handle length and whether the utensil is non-stick. You should choose the kadai which has most of the features you need and matches your cooking style too. The size of the kadai should be chosen based on how much food you usually make. If you have a family of four, then you might need a 2.5 litres kadai, with a diameter of around 26 cm. On the other hand, if you need a kadai for one or two people, then a 1 to 1.5 litres kadai with a 16 to 22 cm diameter will do fine. A longer diameter ensures there’s enough space for heat distribution, and the deepness makes sure the food is properly deep-fried. 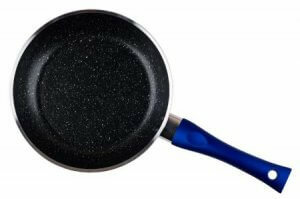 There are various kinds of metals and alloys used for making frying pans, and each of them has different characteristics. The following sections will discuss the advantages and disadvantages of each of these. Since deep-frying requires the use of a lot of oil, an aluminium kadai would be a good choice as it is corrosion resistant. It does not react with oil, so it is perfect for those who want to reuse oil. 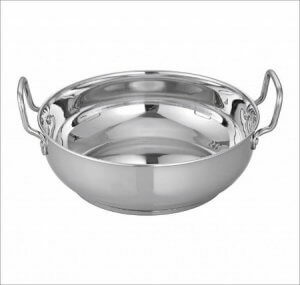 Aluminium types are also usually less expensive, so they’re great for those looking for a cheap kadai. However, since aluminium is much softer compared to other materials, you would have to be careful while cleaning it. Furthermore, it can suffer from scratches and dents easily, it only works on gas stoves, and you cannot wash it in a dishwasher either. Cast iron has excellent heat conduction and retention properties, second only to those of copper. Kadais made with cast iron are useful because they become almost non-stick when coated with oil. Although these are moderately priced too, they are quite easy to clean and durable, so they will last you a long time if used correctly. There are some drawbacks to these types of pans though, the most obvious one being their weight. Cast iron pans are not only some of the heaviest on this list; they are also not the best choice for those who want to reuse oil as cast iron starts rusting easily, especially since oil facilitates oxidation. Stainless steel kadais are another great option, especially for those who use induction cook-tops as it is induction safe. It is also dishwasher safe, so it is much easier to clean it as well. Furthermore, it is fairly corrosion resistant, thus making it possible to reuse oil. Although, it is important to note that it is not the best conductor of heat, and is not the best at distributing heat equally. Due to this unequal distribution of heat, certain areas of the pan become much hotter and can sometimes burn food if you’re not paying close attention while cooking. Deep-frying has deep in its name, so if your kadai is not deep enough, you won’t be able to deep-fry food properly. Indian deep-fried foods need both depth and width to cook, especially in the case of dishes like samosas, vadas, or even jalebis! A deep-frying pan with enough thickness and depth will also retain more heat, so your food will be less susceptible to burning. However, due to this, it may also take a while to heat, thus slowing down your pace of cooking. 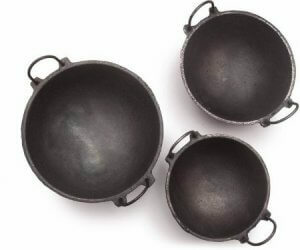 There are two types of handles a kadai can have, one long handle or two shorter handles. The long handle keeps your hands safely away from the hot vessel when you’re holding it, while two smaller handles are better for a sturdier grip. Both of these have their own demerits too; the longer one can put the load on one hand, while the shorter ones put your hands at risk. 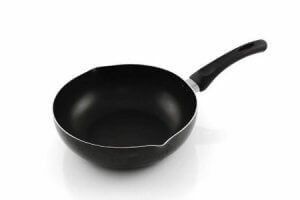 Non-stick cookware typically comes with a Teflon coating, so the food does not stick to the vessel and look better when served. Non-stick kadais are also easier to clean as you do not need to put too much effort to remove any food that may be stuck. This may seem like an unnecessary property for deep-frying, but it is useful when buying a kadai, as we rarely use a pan for one sole purpose. Let us now jump to the part you’ve all been waiting for, our top 10 picks for the best deep-fry pans/kadais you can buy online in India. We hope you’ll be able to find a product on this list to suit your needs, and if you’re lucky you might be able to get it at a discounted rate as Amazon and Flipkart often have sales! This is the only kadai on the list which is perfect for those living by themselves or those who only need small portions. Although it is a lightweight product, it is quite sturdy and has insulated handles to make sure your hands are not burnt if you need to hold it while cooking. Since it is made of hard anodised aluminium, it heats quickly, and despite not being a non-stick item, it is easy to clean. If you are looking for a kadai which can serve more than one person though, this isn’t the one for you as it is too small for that. Due to its size, it is also not the best kadai to prepare bigger deep-fried foods like kachori in as they need more space to cook. It isn’t very durable either, and it is also not the right choice for those looking for an induction friendly pan, as it is not compatible with an induction cooktop. All those looking for a large, stainless steel kadai that works on both a gas stove and an induction cooktop, should definitely consider this product! 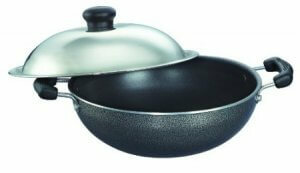 It is quite big so it can easily serve up to 6 people, and since it is made of steel, it is also a very sturdy product. You don’t need to worry about the handles either as they are insulated so they won’t burn your hands. On the downside though, since this is made of stainless steel, it does not distribute heat evenly, and there is a high chance of your food getting burnt if you’re not careful. Furthermore, due to its size, it can be pretty heavy and may seem difficult to handle for those who usually do not use heavier utensils. You would also need to use more oil as it has a flat bottom, and will need more oil for properly deep-frying food. For those who only fry smaller foods like puris or mathis, and do not need to cook large quantities, this would be a good choice! It has a round base, so you can deep fry without having to use too much oil, while its non-stick coating makes it really easy to clean. It works well for those who usually cook for 2-3 people, and do not need a huge kadai. It cannot be used on induction cooktops though, so if you’re looking for an induction-friendly kadai, this is not the one for you. In addition, it is not too deep enough for cooking bigger deep-fried foods like cutlets or chops, and due to its round bottom, it may also be difficult to balance it properly on the stove. This one is for those who need a moderately sized but lightweight kadai to serve at least 3-4 people. It heats up quickly, so you can cook much faster, and it has two insulated handles to make sure you have a firm grip while cooking. It is also quite deep, so you should be able to deep-fry foods like samosas too, and you can easily prepare larger quantities of smaller items such as nuggets or fries as well. 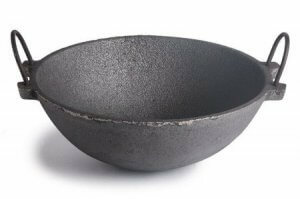 Although, if you are buying this kadai for its non-stick coating, then it might not be the best as the non-stick coating starts coming off after about four to six months, even if you only use wooden ladles. It is also quite expensive for a simple kadai, especially considering that its non-stick coating is not durable, and you cannot use metal ladles with it. 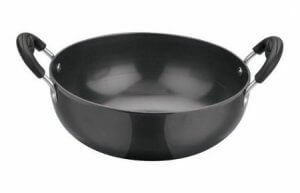 If you are looking for a long-lasting non-stick kadai, you should consider one of the others on the list. If you’re a fan of the traditional type of kadais, then this one would be perfect for you! This 1.75 litres cast iron kadai is big enough for a family of three to four members. It is also durable, and it distributes heat evenly, so there’s almost no chance of burning your food. Additionally, once it is seasoned properly, it is almost as good as a non-stick pan. It heats up quickly, retains heat for longer, and you can use metal ladles with it too. However, due to the material, it weighs almost 3 kgs, which makes it quite a hassle to wash it. Furthermore, it is quite difficult to hold it as it has really thin handles, which aren’t even insulated, so if you are not careful, you could burn yourself. It is also more towards the expensive side of things, so if you’re looking for more budget options, you should consider one of the other products. This is the perfect kadai for anyone looking for a high quality, non-stick option that works on both a gas stove and an induction cooktop. It is 24cm in diameter, so it is big enough to serve about 3-4 people, and since it is a non-stick product, it is also really easy to clean. It has two insulated handles, which provide a firm grip and keep your hands from getting burnt. It is important to note though, that the Teflon coating on this product would get damaged if you used metal ladles with it, so you will have to invest in some wooden or silicone ladles. Furthermore, because it is not very deep, you would probably not be able to deep fry samosas or kachoris unless you made them smaller in size. All those looking for a moderately sized, non-stick kadai, should look into this product. 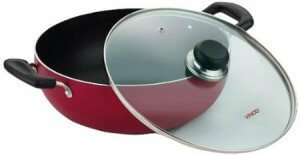 It is a 26cm pan which provides even heating, so you can easily deep fry more than at least two puris at a time. It is very durable as well, and if looked after properly, it would last you for a long time. Due to its round bottom, you do not need to use a lot of oil, and since it is a non-stick kadai, it is also easy to clean. If you do not have a gas stove though, this product will not work for you as it is not induction friendly. 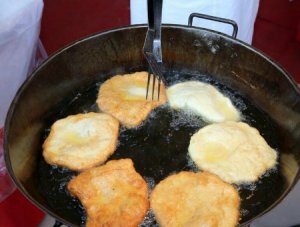 Additionally, the kadai may not be deep enough for deep-frying bigger items such as kachoris, unless you do them one at a time and use a lot of oil. You would also need to pay close attention while cleaning it to avoid any scratches on the non-stick coating and to make sure it lasts. This moderately sized, sturdy kadai is perfect for small families of 3 to 4 members and works especially well as a deep-frying pan as it is deep enough to prepare even foods like samosas. This is a non-stick kadai made of aluminium, so it heats up really fast and doesn’t allow food to stick, which makes it easy to clean as well. It also has insulated handles to make sure you have a firm grip while cooking, and you do not burn yourself. It is an induction-friendly kadai, so it would be suitable for those who have induction cooktops and are looking for a kadai that is not too big. It is also a very durable product and will last you for a long time if you take care of it properly by using only wooden or silicone ladles and washing it carefully after every use. 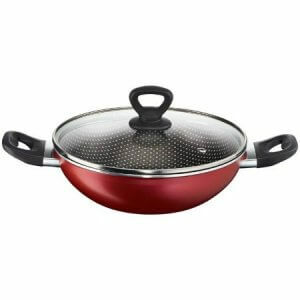 One of the best products on the list, this kadai is non-stick and works both on induction as well as gas stoves. It is made with high-quality aluminium, so it feels quite sturdy, and the size of this kadai is big enough for a family of three to five members, so unless you’re cooking for more people, this should easily suffice. You attach the handles manually once the product is delivered, so there is no chance of damage either. Furthermore, it is really easy to clean as the chances of getting any food stuck at the bottom are really low because of its incredible non-stick coating. Its handles are also insulated so you won’t burn your hands while cooking, and since it is made of aluminium, it also heats up relatively quickly. 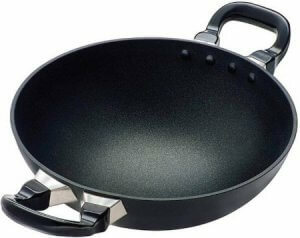 It is the perfect choice for those who have a lot of experience cooking and want to invest in an all-rounder kadai. The best product on this list, it is especially recommended to those who’re looking for a durable kadai with an almost round bottom, big enough to serve 4-5 people! It may not be non-stick, but since it is hard anodised, it heats up quickly, distributes heat evenly, and is easy to clean. It also has two handles, which are made of rosewood, so they not only allow you to have a sturdy grip but also make it more comfortable to hold the kadai. Due to its almost round bottom, you do not need to use as much oil when you are deep frying items, and it is also big enough for bigger foods like samosas or lots of pakoras. Aside from using for deep frying, you can also use it for shallow frying or making stir-fries. 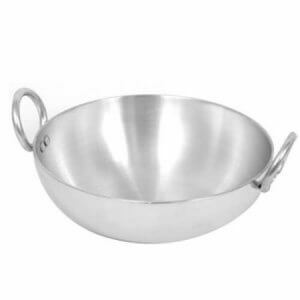 In addition to all that, you do not have to worry about getting new ladles either as you can use metal ladles with this kadai. A kadai may seem like a product you do not need to think much about before buying, but if you want to make sure you buy the perfect product, then you must look at all of the specifications, and compare all the varieties. We hope this article was able to provide you with enough information about what you need to look for when purchasing a kadai for the specific purpose of deep frying food. We also hope the products we listed were to your liking, and you were able to find a kadai to suit your particular needs. Deep-frying foods in a pan made for that purpose will completely change the flavour, so we recommend buying one of the products on the list if you are a someone who enjoys cooking deep-fried snacks regularly.